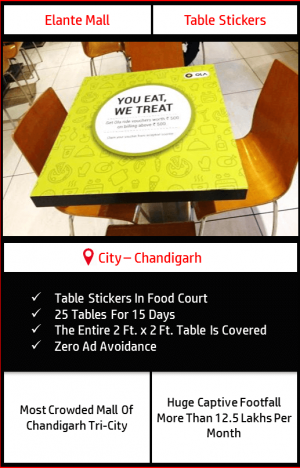 Your Brand would be displayed /installed on 25 tables (As Table Tops) located at Food Court, Elante Mall, Chandigarh for a duration of 15 days. Total Crowd Targeted: More Than 12.5 Lakhs Captive Audience Crowd in a Month. Total Crowd Targeted: More Than 12.5 Lakhs People in a Month. 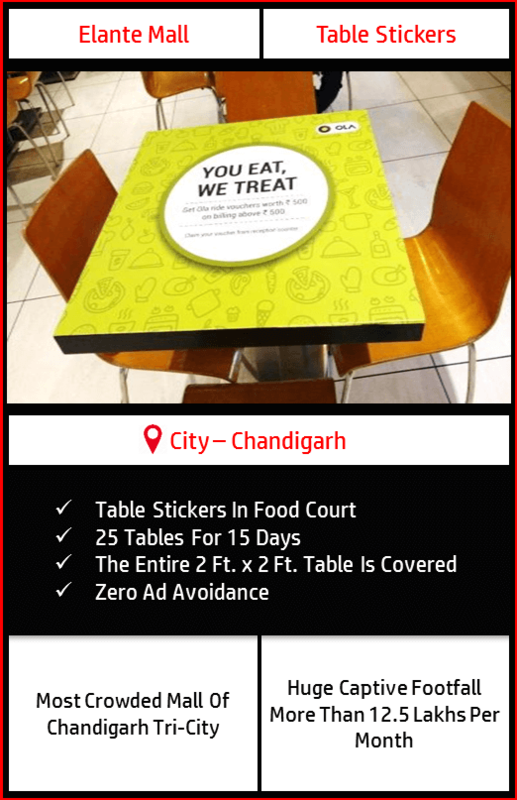 The tables fills the entire food court comprehensively to give your brand a complete strategic advantage & top of the mind recall among-st your target audience. Huge Brand Recall (High visual repetitions of multiple tables while people having their leisure time, gives a huge brand recall). Creative to be provided by the client in CDR & JPEG format both. Campaign once locked can’t be stopped in between. The creative can only be changed after a tenure of 15 days. If creative is to be changed, minimum 15 days should be left in the campaign. The costing for change in creative would be borne by the client itself. The material of the table stickers has to be changed in 3 months. 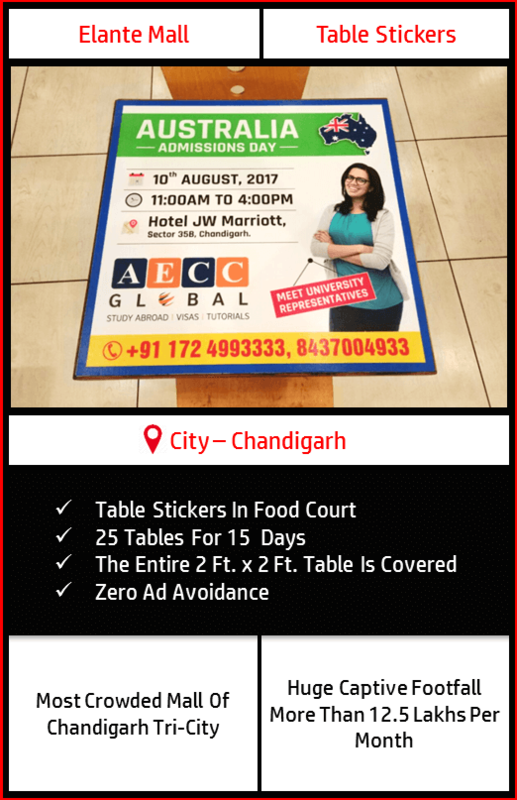 In case of damage of the table stickers within 3 months, the client would be intimated from our side. The new material costing in any case has to be borne by the client. Exact sizes would be shared with the client at the time of the campaign. The creative design is needed in CDR format & high resolution JPEG format. Maximum 5 days time would be needed for full execution of the campaign from the date the package is bought.